As a home mixologist, sometimes I am faced with a request for a drink for which I don’t have all the ingredients on hand. The question then is whether to improvise or just make something else altogether. This was the case the other night, when my co-taster asked for an Aviation. I had to tell him that I was out of both lemon juice and lime juice.1 I was quite surprised when he insisted I try with the grapefruit juice I had on hand. I’ve already documented that Bryan is no fan of grapefruit juice. But perhaps the number of times I’ve given him cocktails with this ingredient that he’s quite enjoyed have apparently opened his mind to the possibilities. I normally use a half ounce of lemon juice in an Aviation, but felt that the grapefruit juice would be too dominant at that level, so I used a quarter ounce of the canned pink grapefruit juice I had on hand. Shake all ingredients. 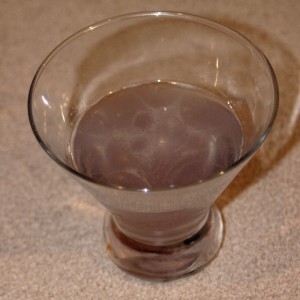 Strain into cocktail glass. What was your most successful experiment with substituting and ingredient? I know! Please don’t take my cocktail geek card away! What is the airfare from Washington National to the 14th Street Bridge? We used to have a cocktail on our menu at work that called for a Canadian dessert wine that we only had in limited quantities – one bottle. It wasn’t a big seller, but when the wine was gone we had to get creative. The best alternative I managed was to use some Martini Rosso, a touch of Limoncello and a splash of Jagermeister. Worked way better than it sounds! You have reinvented the Seventh Heaven (with slightly different proportions and the addition of the Creme de Violette)! Very tasty. I don’t think I’ve ever had a cocktail with grapefruit juice I didn’t like. It is probably partially because it’s a little sweeter than lime and lemon juice, and I usually like my citrus sourness to be balanced with a little sweetness. And for what it’s worth, I think your geek cred will hold up anyway, considering you DID manage to have both Maraschino Liqueur and Creme de Violette on hand…. Actually, I do always use fresh lemon and lime juice, and haven’t bought the bottled in ages. But I do usually use canned or bottled grapefruit juice. It is more convenient for the quantities I use, and I haven’t been overwhelmed by the quality of the grapefruit we get this far north. Or maybe it’s just unfair I compare the the grapefruit I used to get off my tree in Florida.